Sometimes 10 things can be a lot — was it for you? It was a big effort for me to get to 10 things, but they did make a difference. I may have to repeat this one! I shipped off 3 boxes of finished projects, which actually cleared 16 items out of my sewing room, but I’m just counting it as three. I cleared most of the stuff off my cutting table and piled it elsewhere, and while I was doing that, I managed to put away three of the piles where they actually belong. So there’s six. In my office, I filed some things — seven. And threw away some things — eight. 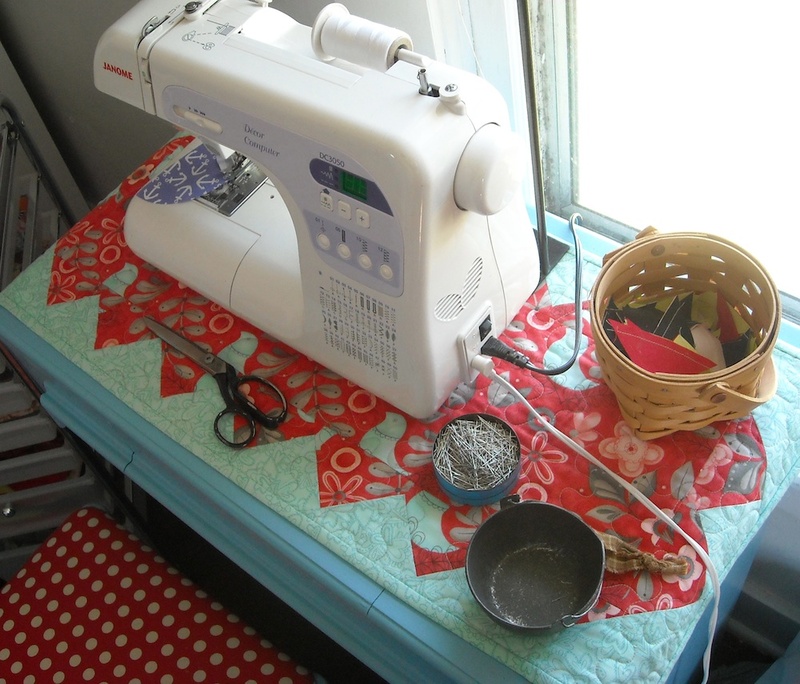 I put away some of the random mess of items around my sewing chair in the living room — nine. And I cleaned out a drawer in my bedroom and got rid of some shirts I no longer wear. While that’s not studio related, I’m counting it as number ten! While I’m away this week teaching at Quilt Camp, it’s a week I can actually live without my sewing machine (since all my classes are handwork classes this time). So after I left for the week, I had My Cowboy take my sewing machine in for service. I know it’s in dire need of some TLC on its innards! Is your machine in need of a good cleaning and oiling? Do you do this yourself? Or do you put it in the hands of a professional? Is it time for you to do it? Your machine will love you for it, and perform a lot better. I’m sure my little Janome will be thanking me for its Spa Day! She works hard, and she deserves it. Since I love vintage and antique sewing machines, and they are easy to take care of, I actually do this regularly. I did not do so well on my 10 things – but every little bit helps. I did get my 3 Mother’s Day gifts finished, put away a box of patterns in the correct place, cleaned up the stack of papers I collected since last time, and cut out the circle shirts for my granddaughters. I just took my sewing machine in to be cleaned a couple of months ago. I try to do at least once a year. It is so hard to be without it. Three things were done – a major pruning outside my kitchen, a star for my cowboy baby quilt, and a box of books out the door. More to come. And addendum: yes, my Juki is scheduled to get her yearly spa treatment, too, but not til the end of this month. Congrats for getting so much done! I really don’t know how you do it all! I didn’t get my 10 mending jobs done yet as I’ve been sick this week, so will still try to get those done and will check the machines. Have fun at Quilt camp! Well lets see. I did 3 flower gardens. 2 at home and 1 at our summer cottage. we made 3 raised beds for our Vegetable gardens. We opened our cottage ( somewhat ). We helped a friend unload some things. (her hubby died 2 weeks ago and she is moving to Florida with her son. )I finished a twin quilt for her for her grand daughter. Cleaned and got rid of some things from our bedroom. And finally through out some things I was keeping for sentimental reasons. Phew! I need to take mine in. I’ve been trying to find the time. It’s across town and I hate to drive in traffic. But, it will be done. I’m blessed to have another one just like to, so I will still be able to sew. I did get my 10 in. I do think it would be nice to do again. I have my computerized machines serviced, but do my vintage machines myself. Congratulations on continuing your organizing spree.